Chadar Trek- Few things you need to know! 1. It's not an easy trek- Many seem to think it is an easy walk. Because there is no elevation gain during the trek and the elevation at which you are walking is mere 11,125ft. Don't be fooled by the numbers. Ladakh region is a cold desert with no vegetation and hence is low in oxygen. Don't think you will not be hit by AMS. And the walk isn't on the fresh white cotton-y snow. It is cold hard ice, much harder and cruel than a rock. The breathlessly beautiful gorge, the white mirror of sky and the never ending fun time walking might turn into a worst ever nightmare if you aren't prepared well and careful. AMS and injuries are very common. I am not giving any advice on 'how to' dress and walk. I just want to say that the trek could be dangerous, so read every possible article and prepare yourself for the trek. Don't stray around like you do in other Himalayan treks. Follow your trek lead on every step. Stay safe! 2. -30 deg C is really cold- I went a day early and stayed a day more after the trek at the base camp with the trek operator. So happened to meet different teams leaving for the trek. Saw many of trekkers ill prepared for the cold. Well, I don't really understand the popular statement- "cold is a state of a mind". But, I do agree that body adjusts to the weather conditions with time. Just in case, you get sick before your body gets adjusted to the cold then? Taking a thick sweater and a wind-cheater isn't enough. Pack layers as mentioned by your trek operators. Cold is felt by different people differently. Some need 5 layers and some may feel cold even in 8 layers. I wore six layers all the time and still felt cold. 3. Tour Operators and Trek Fees- When you pay for the trek you think it includes everything. But, nope! Sometimes, permits are excluded. At one glance looks like every operator is offering the trek for the same price. I was surprised when additional permit fee was asked at the base camp. Make sure you check with the operator before hand that permits are included. It is just an information. Go for an agency that takes really good care of you, couple of thousands plus or minus doesn't matter considering your safety. 4. Our ignorance will kill the Chadar slowly- Yes! Sometimes popularity causes death! Similar thing is happening to Chadar! More popularity ... more people ... more pollution ... not sure how much the Chadar can take and for how long ... once upon a time this Chadar was a sacred ice-highway for the Zanskaris. Now, a big business of selling adventure. Think before abusing Chadar. Do not litter and urinate on Chadar. Your food is cooked using the river water! Use crampons sparingly. Crampons may keep the injuries away but might speed up the melting process of already unpredictable Chadar and so last few batches of the trekkers might have to return with disappointment. 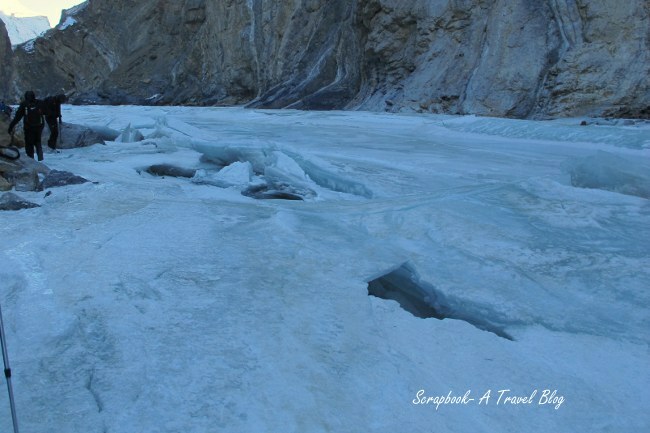 Chadar Trek offers unbelievable experiences. Be responsible. Stay safe and enjoy! Slum Tourism or glorification of poverty? Roti and Rice- Are they so different? Thank you Niranjan! How have you been? The Chadar Trek and ME! !